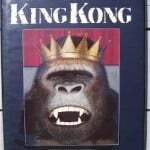 This week we are reviewing Anthony Browne’s King Kong ! When I spotted this monster movie book on my friend’s shelf, I knew I had to order 1 right away. As a child, I absolutely loved the bittersweet relationship between the beauty and the beast and the story has been completely recaptured here in this adaptation by Anthony Browne. Anthony Browne loves apes. So do I.
I have been begging my husband for months to buy me a Donald Roller Wilson original, but unfortunately he does not love me $45,000 worth. Anthony Brown’s illustrations are strange, but in a way that I appreciate. They can tell a story by themselves, even if a child does not read all the words. There is an apple motif that is carried in a few of the pages, the “bride” of King Kong looks exactly like Marilyn Monroe, and his King Kong drawings reflect tremendous emotion, especially at his demise. If you loved the tale of King Kong as a child, you will love this edition. This book is out of print, but you can find it HERE on Amazon. Tell Me! What Do You Like, What Don't You Like and What Else Would be Helpful?